I don’t know why it has taken me so long to think of using bookshelves as nightstands for my room and love the difference that it has made to my room already! 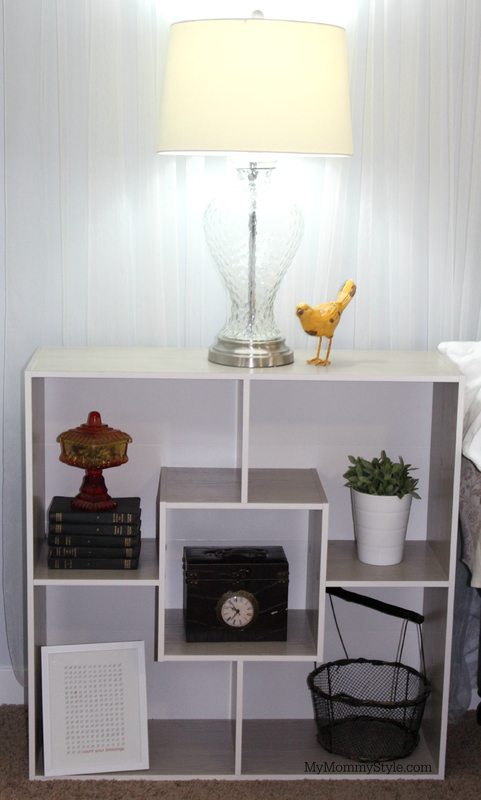 For years we have used what we had and made do with mis-matched or furniture to fit a space because I simply did not have enough money go out a buy new nightstands for hundreds of dollars. I also had a really hard time finding nightstands that were tall enough to function well next to my bed because I have such a tall bed! We have had this bed now for over 8 years, we found it at a local scratch and dent store and because it was a close out item we were able to score it for only $200, as young college students this was a huge win for us and as it was a Cal-King it was a much better fit for my 6’6″ husband than our queen. We had been using some nightstands that were given to me by my grandma, I love the antique feel and that they have sentimental value, but from this picture below you can see how awkward the size was in comparison to the height of our bed. This is actually one of the first posts I did when I had to have Janae add font to the picture for me! 😉 I am planning to share a tutorial of the wall of curtains EVENTUALLY, and sharing this reminded me of that! Anyway, they look fine, they just weren’t as convenient to get to and offered minimal storage. When asked to enter a style challenge with Sauder I was thrilled to have the invitation. Each person in the challenge was asked to style one of three pieces of furniture and make it their own. 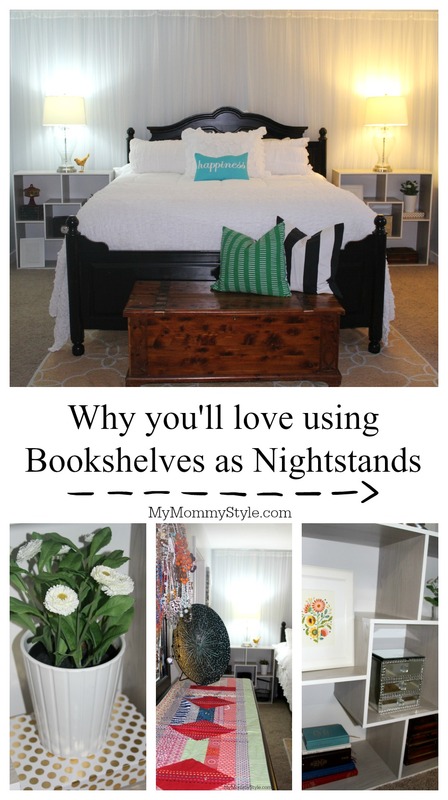 I had been on the lookout for new nightstands and when I saw this bookshelf I new immediately what I wanted to do with it! This piece was tall enough and offered so much space to change the look for seasons, colored schemes or my stacks of books. I can even keep my laptop stored on the shelf and it looks so much less junky! I love that I can add so much visual interest without having too much space taken up next to my bed. These shelves are narrow so I do not trip on them when getting in and out of bed. 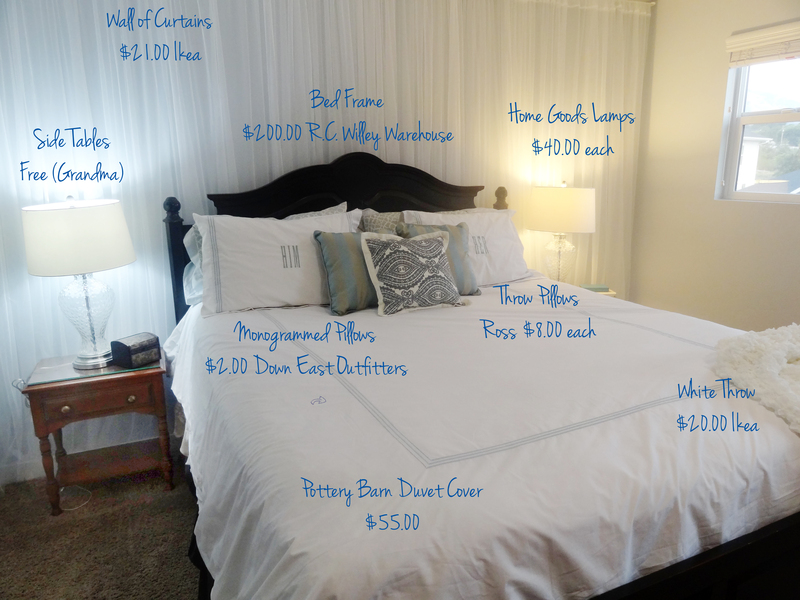 You could easily add canvas totes or baskets if you are looking to hide things away even more. This shelf is my husband’s side of the bed, he loves to store headphones, his charger, and ipad on his side of the bed; I kept it pretty simple and somewhat masculine. With this being my side of the bed I threw in some feminine touches, gold polka-dots, flowers, this print from modifyink.com, and a box for random things I like to keep next to my bed like my daily one sentence journal that I talk about it this post. I am currently reading Selection by Kiera Cass, but if you are looking for more suggestions of book we love you can find them here. I put both of these units together myself and couldn’t be more proud! 🙂 Ha, no really, they were easy to put together and don’t require a hand drill to do. These bookshelves are incredibly affordable and I even daydreamed of buying two more to line a wall. Think of how this would look in a home office, toy room, or living room. I love using things in a way that may not be the first go-to use and while my husband was skeptical of these shelves taking up too much room, once we had them in place it actually made the room feel much bigger! I have always thought that a room without books is a room left incomplete and I just love the look of these modern bookshelves to stack them in.